The NBCOM Youth and Young Adult Performing Arts Ministry consists of praise dance, mime, drama, music, audio/visual and the youth usher department. Our purpose is to acknowledge and reward students who have exhibited outstanding academic performance and are seeking to attend an accredited institution of higher learning. 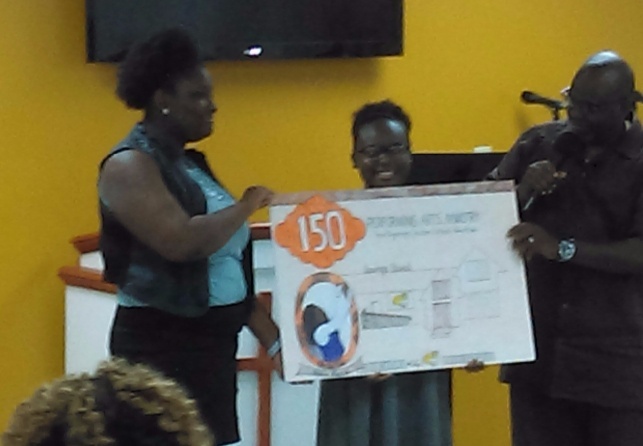 Each year the P.A.M. and Youth Usher Ministry present two graduating senior applicants and one promoting eighth grader with a $250.00 and $150.00 scholarship respectively. If there is only one qualifying senior the scholarship award is $500. The applicant must write a 150-word essay on "What it means to live for Christ". Each applicant must be an active participant of the P.A.M. or Youth Usher Ministry and be active in outreach in the community. They must maintain a "B" average, have good attendance and no disciplinary actions in school. The Performing Arts Ministry Scholarship Fund came into existence through dedicated members of New Beginnings Christian Outreach Ministries and generous givers like yourself. Because of your support we can continue to help children fulfill their dreams of a higher education and a brighter future. To become a sponsor or to give a donation of any amount, please see below! Other Amount: Every amount helps! Nydia Morris the 2016 Performing Arts Ministry 8th grade Scholarship Recipient...Congrats! !